I love working with the Episcopal Youth Event Liturgy & Music Committee. We are all so different, literally stretching to every corner of the country, and we all have such unique experiences of God through worship, but somehow, we can joyfully come together and come up with some very exciting plans for the liturgical and musical experiences for EYE14. This past week, we finalized our line-up for possible preachers and presiders, and are going to send the invitations out very soon. We are also close to officially having our band for the event that will play at all of our services. We are expecting well over 1,000 people in attendance, so the services we’re planning must be on a huge scale. However, because the services are only an hour and a half, we must create them in such a way as to impact all who are in attendance. We are having a great time incorporating our theme, “Marked for Mission.” We can’t wait to show you how we’ll do it in Villanova next Summer. As Christians we are called to join God’s mission. As the Christian Church, we are called to serve in mission in communion with all the saints. But, discerning our particular personal and communal role in engaging God’s mission can feel overwhelming, unclear or even confusing. So, how do we get started on such a monumental task? A Companion: God is calling our church, as a whole, to be a companion with other churches and beyond. Dioceses and congregations are living out their calling to become companions with dioceses and congregations in our country and around the world. Individual missionaries are ministering as companions in the places where they are called to serve. Literally, companions share bread together. Look at Matthew 14:13-21. A Witness: “You are witnesses of these things,” said Jesus to his disciples. Witness in a word means sharing the story of what God has done with us, in light of the story of what God has done in Christ Jesus. Such witnessing is the natural and inevitable fruit of a life in Christ, and it is the heart of evangelism as a mission imperative. Look at John 4:1-42. A Pilgrim: Episcopal missionaries today see themselves as pilgrims, growing in their knowledge of God through the perspectives of the people to whom they are sent, learning as much as they share, receiving as much as they give. Look at Hebrews 11:13-16. A Servant: “I came not to be served but to serve,” said Jesus. Servanthood in mission means that we listen to the stated needs of our mission companions, look for signs of God’s work in them, and collaborate with them in discerning how God is guiding the implementation of mission vision. It means that missionaries and the church put aside prior images of our companions, preconceived analyses of their situations, and ready-made solutions to their problems. Look at Philippians 2:1-11. A Prophet: Episcopal mission pilgrims today often find their views of political, racial, and economic relationships in the world challenged and transformed. Experiences of poverty, suffering, and violence alongside experiences of affluence, oppression, and security often radicalize missionaries, whether they are long-term missioners, visiting bishops, or short-term teams. These are prophesy to the sending church, prodding it to inquire more deeply into dynamics about which it may have become complacent or resigned. Look at Isaiah 61:1-4. An Ambassador: In addition to witness in word and deed as ambassadors of Christ, the missionary and missionary community are ambassadors of the sending church. This calls for living out the highest ethical standards in personal honesty, respect for others, financial transparency, and faithfulness in personal and professional relationships. Look at 1 Timothy: 4:6-16. A Host: “Let a little water be brought, and wash your feet,” said Abraham to the three strangers who appeared at Mamre. “Let it be to me according to your word,” said Mary to the angel Gabriel. In initiating mission, God is not forcible but invites a response of hospitality. Look at Luke 10:38-42 or John 11:1-12. A Sacrament: As the body of Christ, the church is a sacrament of Christ, an outward and visible sign of Christ’s inward and spiritual grace. As members of the body, all Christians participate in the communion of the saints and so are members of the sacramental revelation of God, embodied in the incarnation of Jesus Christ. A Christian on mission is a sacramental sign of God’s mission to reconcile all people with one another and God in Christ. Look at Luke 24:13-35. As you are planning a mission experience for next year – or maybe as you are planning to join us in 3 Days of Urban Mission following the Episcopal Youth Event 2014 – WHO are you and your faith community being called to be as missionaries of Christ? This blog post is another excerpt from the forthcoming Episcopal Youth in Mission Manual, which is being co-written by Cookie Cantwell (Diocese of East Carolina), Beth Crow (Diocese of North Carolina), and Wendy Johnson (Diocese of Minnesota). The Manual is still in production. 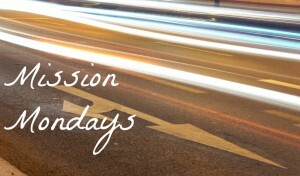 However, in support of Mission Monday, portions are being made available for posting on the EpiscoYouth blog.